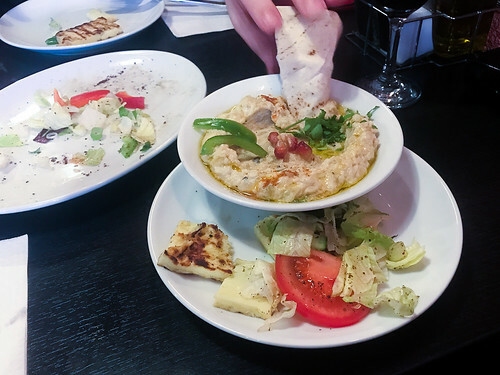 Cold meze dishes range from humous and baba ganoush (aubergine dip) to stuffed vine leaves, salads and oven-baked aubergine moussaka. 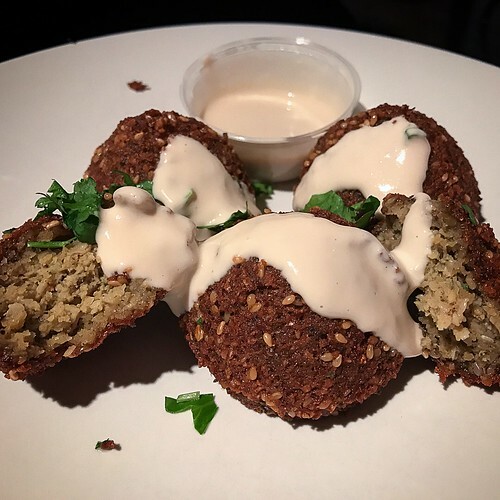 In the hot meze menu you’ll find grilled haloumi, spinach parcels, minced lamb meat balls, and falafel (pictured above – gorgeous). 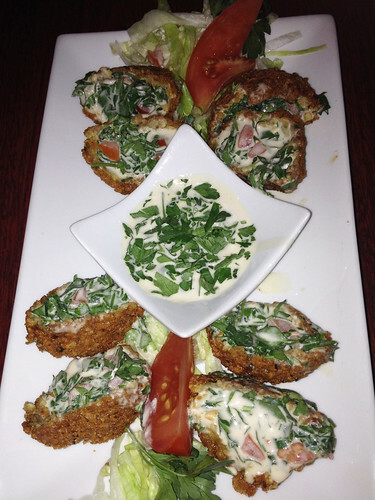 The Fayrooz platter is a house special. 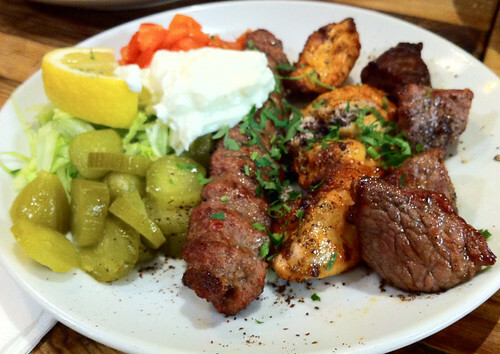 A fave of K’s, this sharing platter for two contains kofte, taouk, lamb kebab cubes, mixed lamb + chicken shawarma. And, @ £22.00, it comes with salad, sauces and flat bread. There’s been a kebab shop in this unit for years but it’s been smartened up considerably since Fayrooz took it over earlier in 2017. 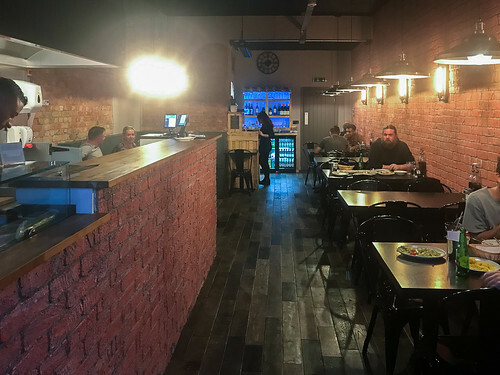 Most business seems to be take-away (you can arrange delivery through the likes of UberEats) and there are about eight tables for eat-in diners. Service is leisurely Lebanese/ Mediterranean in that it’s friendly, welcoming and not in any hurry (to the extent of being painfully slow on a couple of occasions, in our experience). The verdict: A good cafe option in Catford serving freshly prepared dishes (good quality chargrilled meats and fish) if you’re not in a hurry. In the railway arches by Waterloo station, Topolski gallery-café-bar-venue (a part of the Southbank Centre estate) serves ‘East meets West’ Lebanese flatbread pizza, sharing platters, and a good range of cocktails and drinks (with a 2-for-1 offer on selected drinks between 6-7pm, Mon-Sat). As you might expect, the interior has an industrial feel (great look, poor acoustics) and – being Feliks Topolski‘s former studio – the walls are covered in his paintings. During the day (10am-5pm) you can relax in this airy café-bar (maybe after experiencing a cultural event on the South Bank) and choose from pastries, light bites, sandwiches and soups and pizza. Then, from 5pm, only pizza and sharing platters are served. 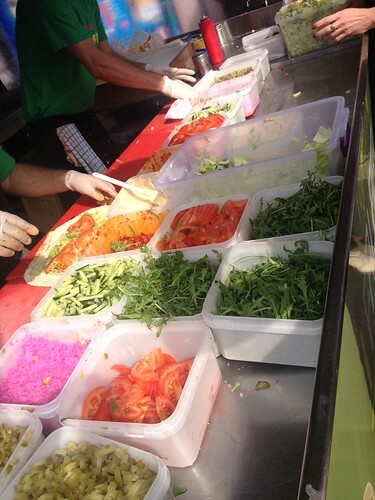 It’s £6.50 for a margherita pizza and £1.25 for each topping (so £9.00 total if you choose two toppings). 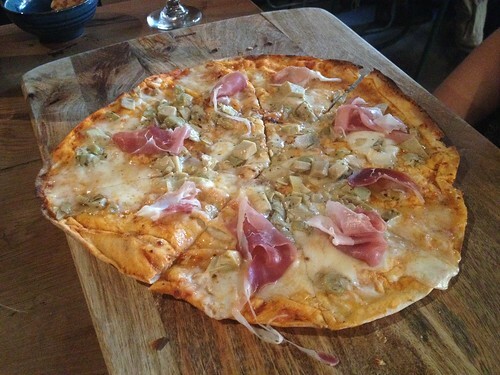 On our visit last night, after seeing Circus Geeks: Beta Testing at the Udderbelly festival, I ordered a mushroom and parma ham pizza, while L had artichoke and ham. We ordered at the bar (no table service). Our order included a bottle of prosecco @ £29.00. And food arrived quickly. It was quick and easy, and there seemed to be a fairly rapid turnaround on tables, making this is an ideal place to come to for impromptu dining after a South Bank event (as restaurants around here are often booked up, making it a challenge for walk-ins). 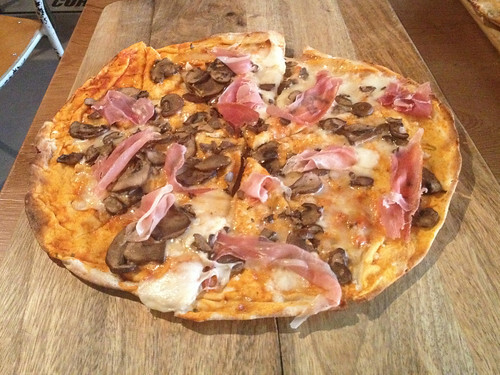 The freshly baked flatbread base was udderly (doh) thin and gorgeous – a really good pizza. A slight downside was the noise: with loud music playing and a lack of soft furnishings in these exposed wall arches, it was quite hard to hear each other talk (so not the most ideal place if you want to have a good catchup). The verdict: Spacious venue. Fast (but decent) food. Handy for South Bank events. Any restaurant that opens next door to Santa Maria del Sur on Queenstown Road, Battersea, is going to have fierce competition. It may not be surprising then, that Dalila’s predecessor, Tom Ilic – a French-style restaurant that looked like a carnivore’s dream – only lasted a couple of years. Disappointingly for me, it closed before making it to the top of my ‘to try’ list. 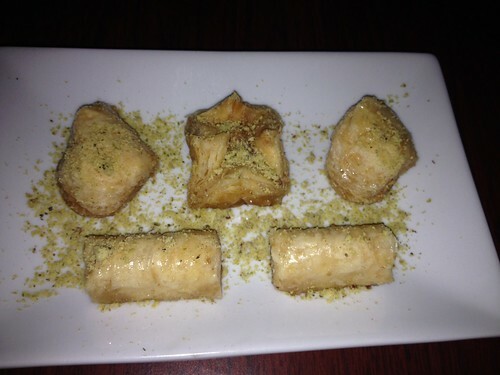 Dalila, a classy Lebanese restaurant opened in 2013 in the same spot. J and I came here on a Friday evening recently. At the end of a working week in the City where everywhere’s overcrowded and hectic, it was pleasing to get out of central London and unwind over great food and wine in the serene, spacious restaurant that is Dalila. We ordered very leisurely. Our server gave us help with food and wine choices when asked. Nothing was rushed. 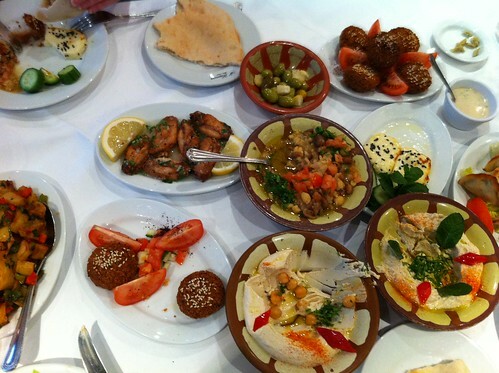 We shared a ‘mezze’ selection of both hot and cold dishes, accompanied by a dry white Massaya Blanc wine from the Bekaa Valley @ £21.50 (very reasonably priced and very well suited to the food ordered – it went down very well). 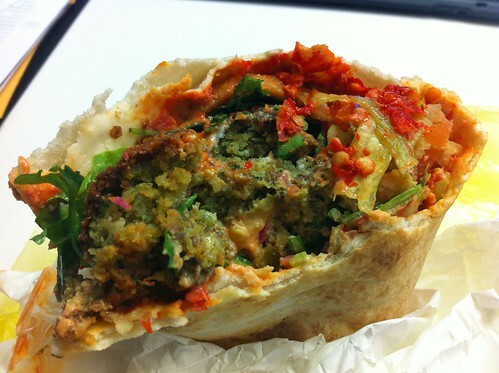 I eat a fair amount of falafal. I love it. Some of the best I’ve had being from street food stalls. 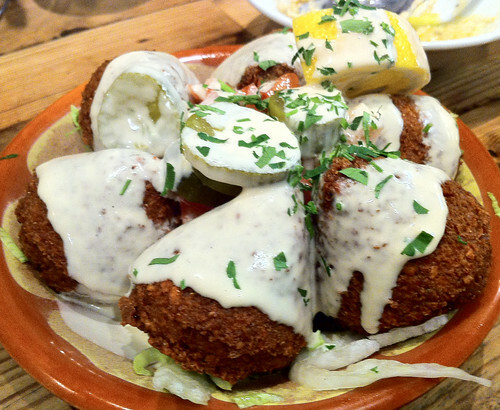 But Dalila’s falafel (deep fried beans, chickpeas and fine herbs croquettes, served with sesame paste @ £5.95) is in a league of its own. It is quite simply the best I’ve had, coated in coarse, crunchy crumb and stuffed with fresh herbs. Just writing this makes me want to go back right now and eat some. The super-soft, stringy, melt-in-your-mouth halloumi was in a league of its own too. 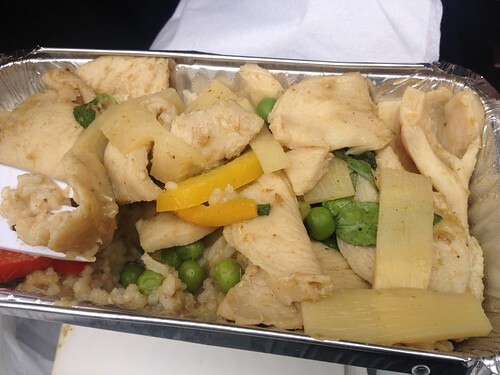 No rubbery squeaking here that you often get with supermarket longer life halloumi packets. Though I must admit I quite like a cheese that squeaks. The moutabel (grilled aubergine puree with sesame paste and lemon juice @ £4.95), hummus @ £4.75 and fresh pitta bread, plus calamari pane (squid dipped in a spicy flour mixture and fried with garlic, coriander and chilli @ £5.95) were all an absolute treat. 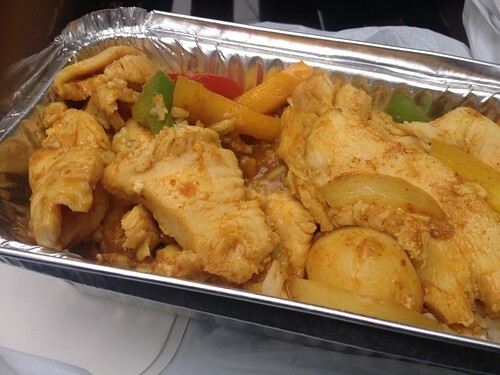 We also shared batata harra (potato cubes sautéed with garlic, sweet pepper, chilli, onions and fresh coriander @ £4.95), samke harra (grilled fish fillet with onions, garlic, tomatoes, green pepper, red pepper and coriander) @ £6.95 and – even though we were stuffed – managed to squeeze in five *tiny* baklawa pastries between us (filo pastry filled with ground nuts, baked and then drenched in honey) @ £3.95. 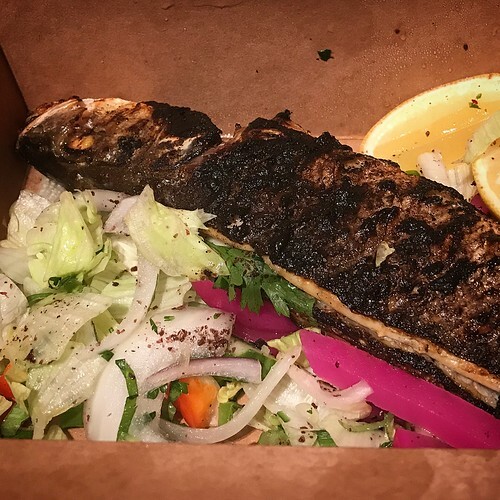 The verdict: Dalila might be off the beaten track (it’s a few minutes walk from both Queenstown Road or Battersea Park rail stations or a good 15 minute walk from Clapham Common tube station) but it’s well worth a visit. 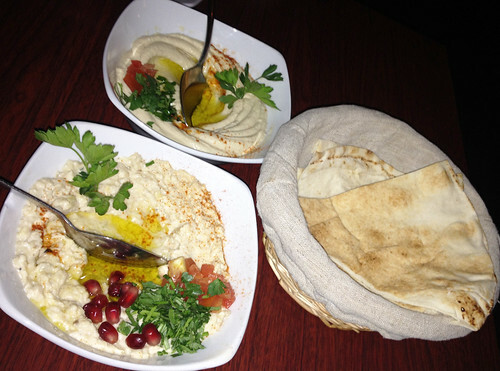 Some of the best middle eastern food I’ve ever had. I can’t wait to go back. 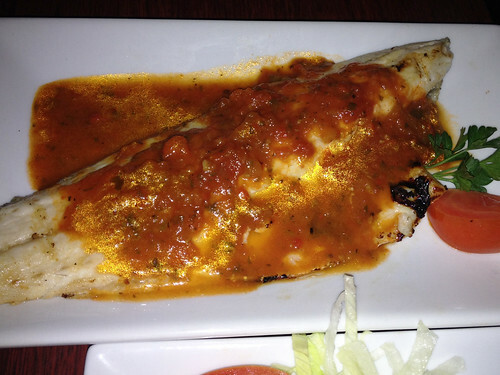 The a la carte menu is reasonably priced as it is but they also offer set menus. And if you go during off peak hours, they accept Tastecard (currently 2-for-1 for a max of two people) but check the website for latest offers. 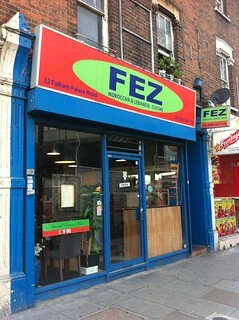 An evening out in Hammersmith doesn’t end as planned but a mezza meal at Fez more than makes up for it. I’d got tickets to be part of the audience for last Wednesday’s recording of The Last Leg at Hammersmith Studios (the episode featuring Russell Brand). To make an evening of it, I wanted a good restaurant that was handy for the studios, that served middle-eastern food and so would have lots of vegetarian options. 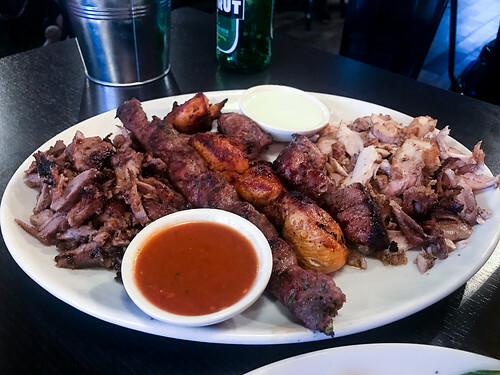 Fez on Fulham Palace Road scores well enough on community review sites like TripAdvisor, is convenient for the recording studios, has a varied menu and is reasonably priced. My only concern was that, from photos on the web, it looks like a very basic cafe – and a bit of a dump – from outside. I took a gamble and booked a table a couple of hours before we needed to start queuing (as with all TV recordings, audience tickets are over-allocated to ensure the studio gets filled and you’re not guaranteed entry). It’s fair to say that Fulham Palace Road (the A219) is a traffic-heavy road, right next to the seriously busy Hammersmith Flyover. Any grubby shop fronts can be excused to some extent, as it must be a real challenge keeping buildings pristine here. And immediately inside Fez, we get a warm welcome from the waiter and are seated at a table for two in the middle-eastern styled room with cushioned seating skirting the walls, ornate light decorations and candles. On ordering a mezza to share, he quickly moves us to a larger table that can accommodate all of the plates. 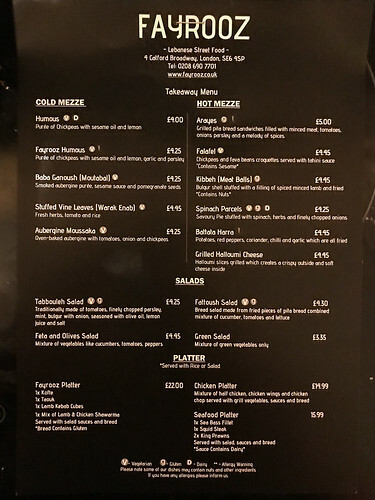 There’s a good food menu (typical Middle-eastern fayre) and wine list (for example, a good dry white like a Lebanese Cave Kouroum or a French Picpoul de Pinet are less than £20 a bottle) and G and I home in on the vegetarian mezza at £21.95 for two. I’m not sure why we think that eight dishes may not be enough (ok, two are ‘just dips’) but we also order a Fattoush Salad (lettuce strips, tomato + cucumber chunks, peppers, sprinkled with fried pitta bread ‘croutons’ and lemon juice) @ £4.50. This is a very satisfying banquet (each dish is carefully cooked and presented and nothing disappoints). Even so, G can’t resist a chocolate cake for dessert @ £4 (it’s slightly frozen in the middle and I wonder if it’s a Sara Lee frozen cake) and I do the decent thing and keep her company with baklawa @ £4 (it’s slightly dry, there’s no honey in sight). 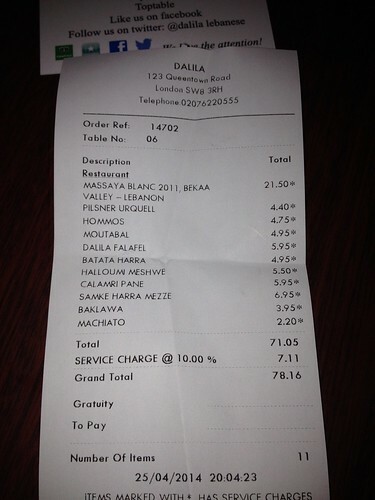 The total bill for two, including food, drinks and a 10% tip, comes to £64.00. It’s worth noting that Fez is currently in the Tastecard scheme (offering a 50% discount off food to Tastecard members; some restrictions apply). With happy hearts and bellies, G and I leave Fez to queue for The Last Leg recording at Hammersmith Studios. Our good luck runs out and we’re turned away. 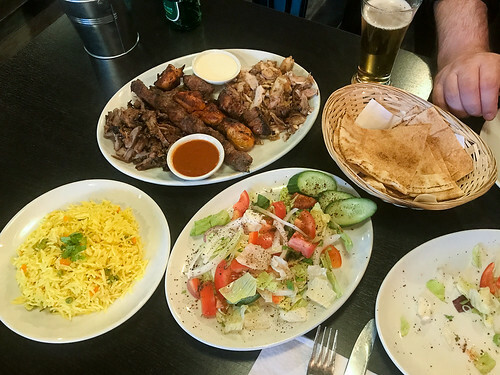 A teeny tiny Lebanese restaurant within spitting distance of Tooting Bec tube station, Meza can accommodate about 20 diners at a time and has the feel of being squished cosily into someone’s living room. It’s intimate (an open kitchen takes up half the room), popular, and gets booked up quickly. It’s also cash only. There’s a 1.5 hour turnaround time on tables (our table this evening was booked for 7.30pm and by 9pm we were being asked to leave, to accommodate another sitting). 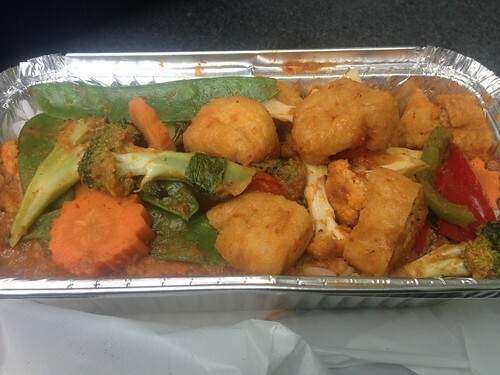 But service is fast and attentive (without feeling rushed) and it’s well worth booking ahead for. The menu is fairly short and sweet, and while you can choose a selection to share, we – at our server’s excellent suggestion – went for a mixed meze at £15 a head. 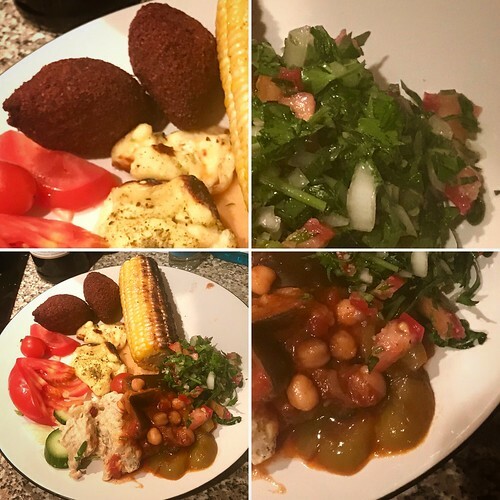 These freshly prepared dishes kept arriving at the table in a steady stream and all proved popular, particularly the moutabel (baba ganoush) stuffed vine leaves, and spicy sausages. We shared two bottles of a very palatable house red wine (@ £12 a bottle) and, including a 10% tip, the total bill came to £22 a head. Excellent value for fresh, good food. Three of us (at work) decided to go out for lunch today. It was a last minute idea and – this close to Christmas – wasn’t surprising that most nearby restaurants in the Mayfair/Shepherd Market area were booked up. 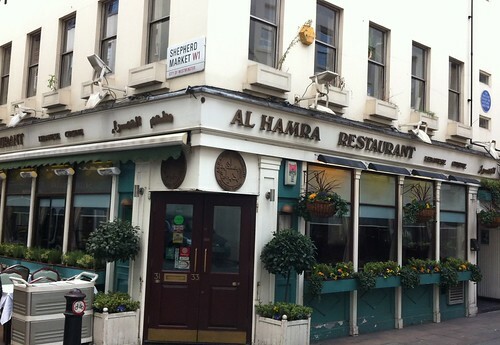 Fortunately, we were able to reserve a table at Al Hamra, which turned out to be fairly quiet over lunchtime. 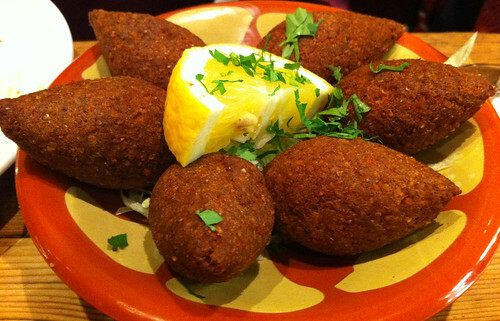 Al Hamra describes itself as “the finest Lebanese restaurant in London” (quite a superlative; quite a claim – we would see). Their menu has an un-customer-friendly warning that the minimum order is £20 per person excluding drinks, even at lunch time. And there’s a cover charge of £2.50 per person. So, be warned – don’t come here if you’re after a light lunch in the region of £10 – £15, as you’d end up being charged £22.50 minimum (plus drinks and service) anyway. The total lunch bill came to £102 (so £34 each). While the food here is good, it’s probably a bit over-priced. 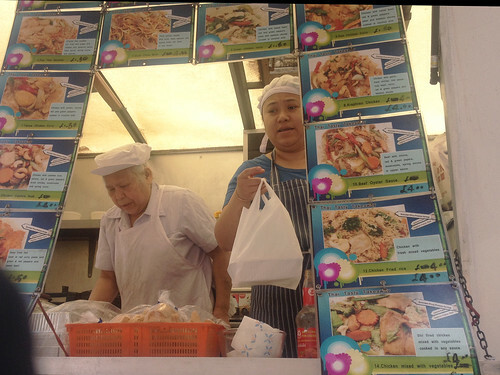 I suspect we’ll stick with our regular lunchspot, Ye Grapes (Thai) – also in Shepherd Market – in future.